As i mentioned yesterday, we are getting ready for a multi-family yard sale. I thought folks might like a little more information about how we sort through our stuff and organize a room. Our goal is to have a functional, comfortable space. Let’s start with the kitchen – home of the dreaded junk-drawer. In our kitchen, we have seven drawers – a drawer for silverware, a drawer for sharp knives, a drawer for various utensils (spatulas, tongs), a drawer for kitchen towels and wash cloths, a drawer for electronics (chargers, charging cords), a drawer for home office supplies (pens, pencils), and a drawer for bills and paperwork. Our process is pretty straightforward. The contents from a drawer is removed and placed on the kitchen table. Items are sorted – and then placed in either their appropriate drawer, placed in a box labeled resale, or placed in the trash. Items which belong in another room are placed in a basket. As soon as all of the drawers have been sorted, these items are IMMEDIATELY taken to their proper storage place. Usually, I’ll have tools wind up in the kitchen, because I’m too lazy to put them back in the shed. It’s amazing how many screwdrivers and hammers make their way inside. When organizing the junk drawer, tools are placed in a basket, and then taken to where they belong. This process works great for most drawers – but paperwork can be a bit overwhelming, especially if it’s been a minute since I last organized. So, rather than try to sort through every, single piece of paperwork (especially when my focus is elsewhere) – I quickly eliminate any obvious trash (sales circulars, junk mail, old school papers) – and then I put all of the remaining paperwork back in the drawer, in a folder or a small basket – to be sorted at a later date. We then went through our cabinets. Like our drawers, each cabinet is designed for specific items. This past week, we organized all of our bowls, kitchen gadgets, pots, and pans. We used the same process for the cabinets as we did for the drawers. We then repeated the same process for the pantry. In less than a hour, we managed to organize our entire kitchen, while also finding several items for our yard sale. Side note: We are not overly-sentimental people. We have a few “special” items in our home (keepsakes, gifts from friends and family) – but we are not afraid to let stuff go. We used this same system to work through our entire house, room-by-room. 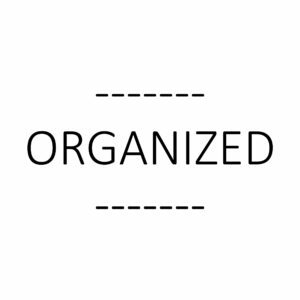 Side note: We like to be organized, but we’re not big on labeling stuff or worrying all that much about presentation. Our baskets and storage items are a hodgepodge (anyone still using that word?) of brands and colors. Our goal is to get the stuff into the right drawer, cabinet, or section of the closet. Some folks are really into organizational-systems, and that rocks for them, but we are more into simplifying, without much fuss. It feels nice to chill in a clean, organized space. Please use the buttons below to share this post and connect via social media. Have a blessed day! Dude, you have no idea how much we are alike. I don’t know if I have ever read anything you have written and not had the same thoughts or approach to doing something. Lots of similarities between our families (Molly and Shon too) and we never see each other. Good stuff. Keep up the good fight! !